: Latest Update: Downloadable results data! Latest Update: Downloadable results data! 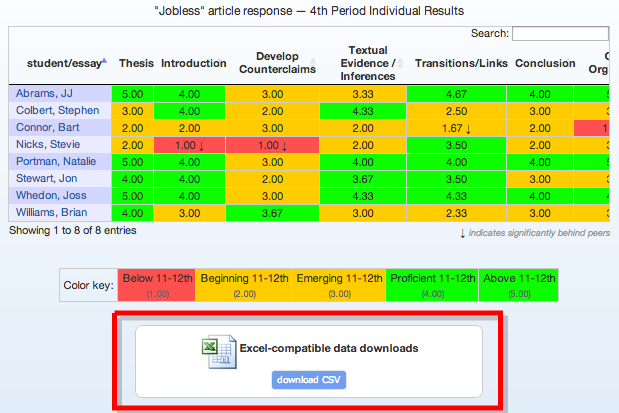 As part of our push for new and improved data reporting, you can now download all of your results/grading data for each of your assignments. This feature is fully reverse-compatible with all existing assignments. We don't believe in vendor lock-in so we're happy and excited to offer yet another way for you to access your results data. It's your data; it shouldn't be trapped on our servers. Reminder: The scores here are just numeric representations of the evaluations you made in the grading app while grading each paper. EssayTagger never does any auto-scoring or auto-evaluation for you. It's always your brain driving the process. The download is in the CSV format. This file format is very common and well-supported: it can be opened by Excel, imported to a Google Drive spreadsheet, and imported into most other spreadsheet programs. All of these new data reporting features and downloads are just the beginning. Please let us know what sorts of data and what kinds of analysis you're looking for. Help us understand how you plan on using this data and we will keep evolving and improving this aspect of the site. Thanks! Latest Update: New data reports! Latest Update: Common Core progression-tracking!